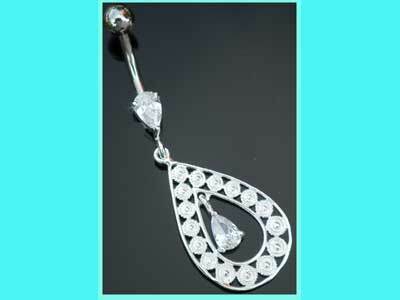 Sterling silver belly bar with a large teardrop dangle which features a small clear crystal suspended inside it. The big teardrop measures 24mm x 16mm and the smaller crystal drop is 6mm. Powered by ShopFactory to sell P12838 online. All-in one eCommerce and online shopping cart software.